I drool over sequins, delight in dessert displays and drink most of my liquids out of a mason jar, but there's one thing I simply can't resist, and that's a classic. Throw in a little Father of the Bride, and I'm absolutely hooked. You likely saw this gem just a few weeks ago on Style Me Pretty, but I simply couldn't resist sharing something that's so captured my attention! 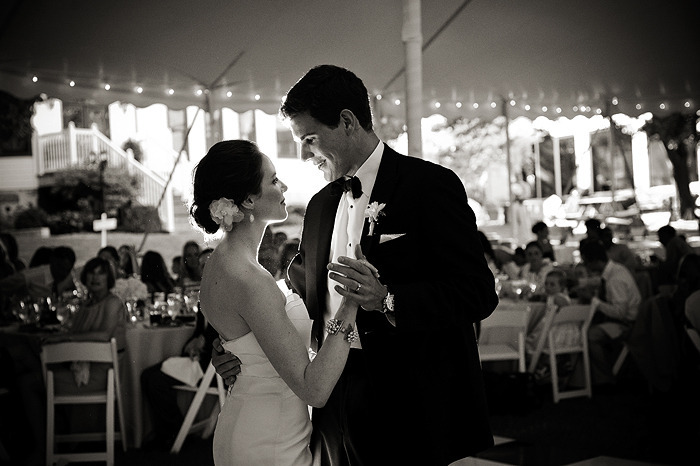 Meg and Dan married in Elkhart Lake, Wisconsin, where they met six years earlier. 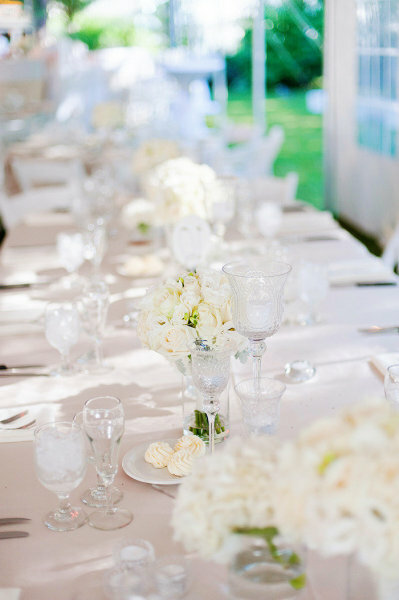 The bride, who'd dreamed of a tent wedding since she was a girl, fell in love with the lawn of the Victorian Village Resort, and she and her mother, along with Laura Cooper of Cooper Consulting Events, planned a beautifully-appointed celebration with their reception's elegant vistas in mind. Golden letterpressed invitations from Bella Figura announced the celebration's classic deportment, and perfectly matched the gauzy Vera Wang bridesmaids gowns and gold Grecian sandals. The bride chose a fit and flare Amsale gown and Vince Camuto heels, paired with a floral fascinator by Sara Gabriel and pearl J.Crew bracelet. Meg and her bridesmaids all wore earrings from Anthropologie and carried lush white rose bouquets rimmed with dusty miller by florist Silvana Cassia of Twig Flowers, while Dan and his groomsmen wore classic tuxedos from Men's Wearhouse, ties from Brooks Brothers and simple freesia boutonnieres. After a familial first look, where Dan was joined by Meg's father and her brothers, and a traditional ceremony accompanied by the Jubilate String Quartet at the Holy Name of Jesus Catholic Church, where Meg's family priest gave a touching homily, guests enjoyed vodka lemonades and Wisconsin cheese and meatballs while the newlyweds took photos on a friend's lovely property. Under the warmly lit tent, provided by Canopies Events, guests found tables covered in roses, hydrangeas and candles; an oversized slate from an antique shop and framed chalkboards from Her Majesty's Pug's Etsy shop served as dinner and cocktail menus, and a classic black and white checkered dance floor was the perfect finishing touch. 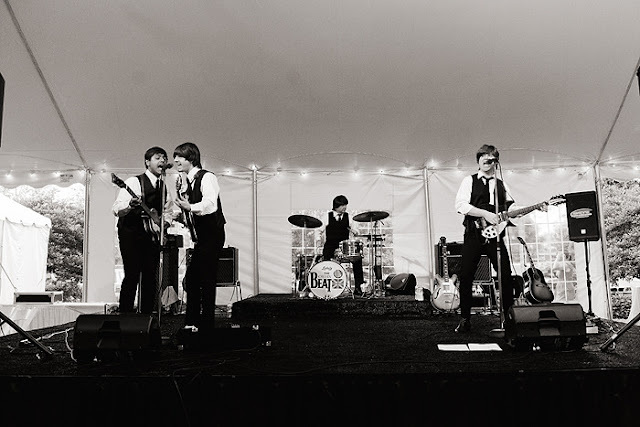 Following her mother's advice–that booze and a band will make a great party–Meg and Dan hired a Beatles cover band called the Cavern Beat, who all the guests adored. 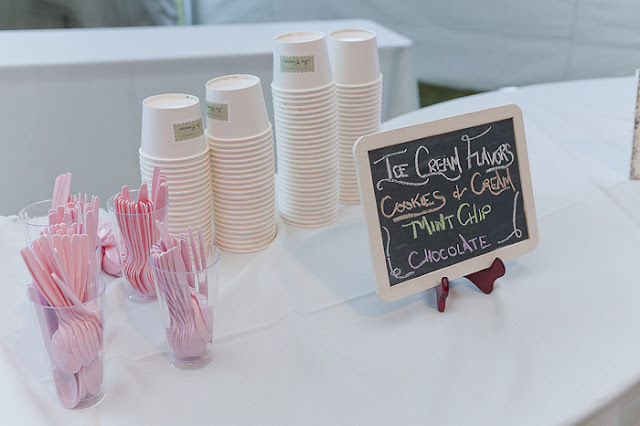 Meg's mom also baked the molasses, snickerdoodle and chocolate chip cookies served for dessert, alongside the stunning buttercream wedding cake by Natalie's Pastries, chocolate ganache cake from the local Piggly Wiggly, and an ice cream bar from Scoops Ice Cream Parlor. 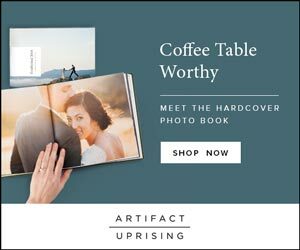 Of course, we can't enjoy a wedding without the work of talented photographers–in this case Anna and Jonathan Wheeler of Anna Page Photography, and Matt Buckman and Élan Villamor of I Do Films–if you're in the mood for a truly gorgeous video, look no further! I adore this! Is it me or weddings are getting more personal? I really love that! 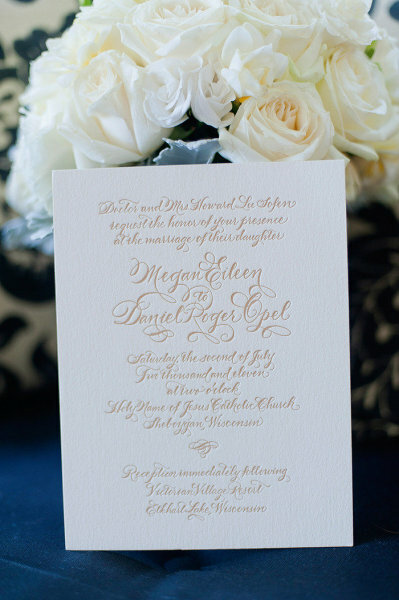 I love the letterpress invitation with the blush scrolly font...I could look at invitations for hours. Such a classic wedding! Lovely. 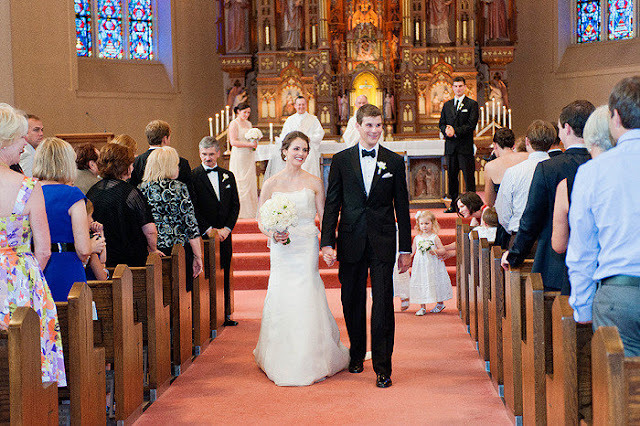 i haven't seen a classic traditional wedding like this in a long time... lovely! 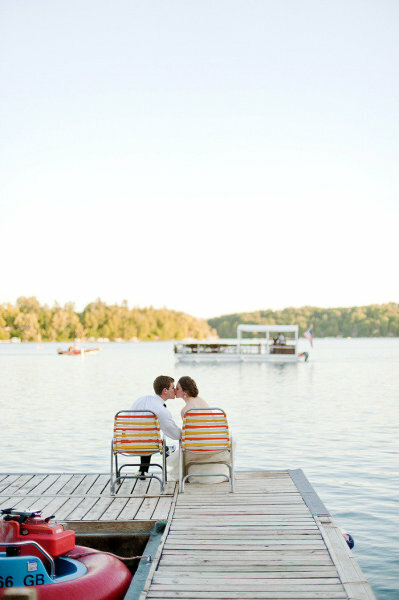 LOVE that picture out on the dock, so totally sweet! such a pretty wedding. Everything feels so light and airy. I love that they hired a cover band. Thats awesome! You are right...how wonderfully classic!!! That hand-writing letterpress invitation is awesome. 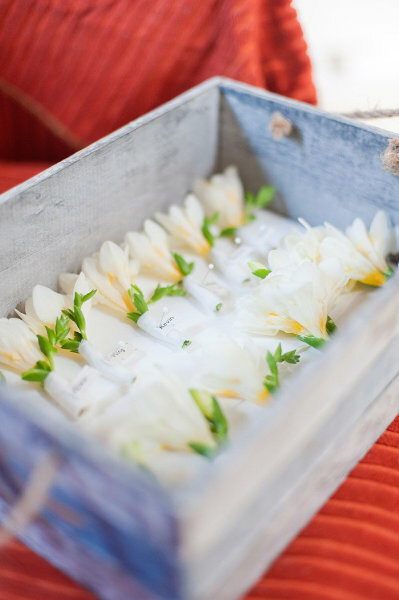 Every detail about this wedding is divine. I'm not much of a too neutral or too much color gal but, I do love when neutrals are done just right. 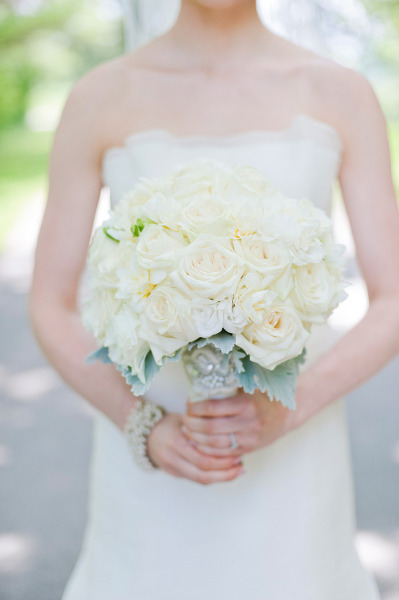 This is elegant and perfectly feminine. 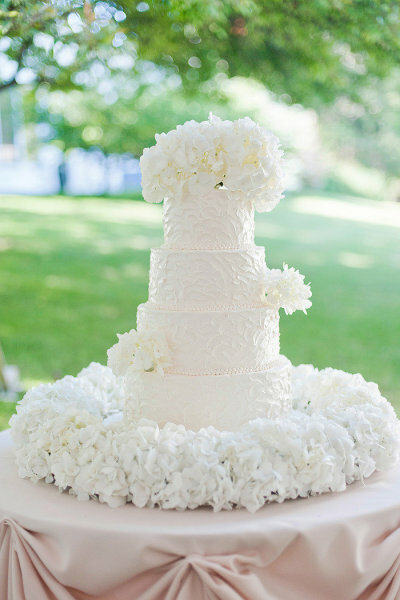 The cake is an idea so simple it's worth stealing. 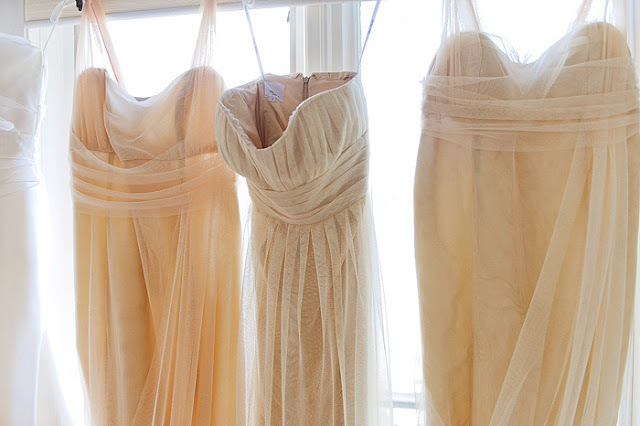 i seriously love the bridesmaid dresses. 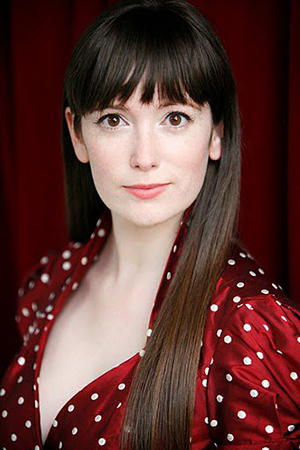 dear vera ~ you are amazing! :) no really, i think they are so elegant!! I love how light & airy the bridesmaid dresses are. 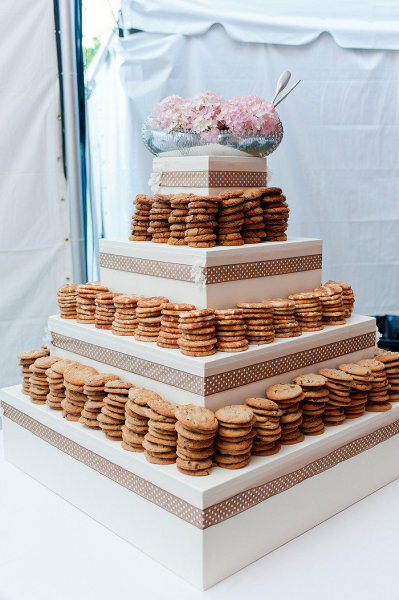 Also cookie towers should be mandatory at all weddings - yum! I would have loved to be a guest at this wedding. Those last few pics look like so much fun! I missed this on SMP so thanks for sharing! I like the bridesmaids in ivory, not done often but very sweet. never seen bridesmaids wear off white. must say, i dig it. and cookies!!! 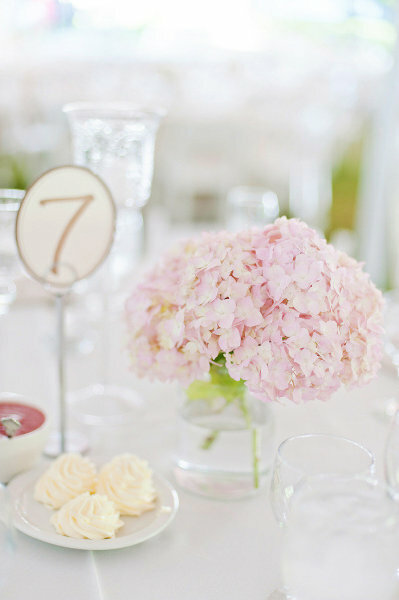 The soft pink linens and hydrangeas are my favorite! I dreamed of a lakeside tent wedding too. Unfortunately the lake is the most expensive place to marry around here! that cookie-cake is the best idea ever! 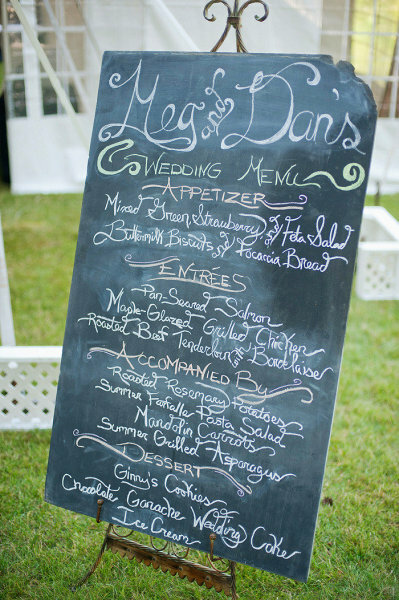 Love how fun and intimate this wedding is! And the cookie cake? Genius! Congrats to the happy couple! Cookies and ice cream... I love it! cookies and a Beatles cover band. say no more. Ahhh. her smile is adorable:) And that lawn chair photo precious! shut the front DOOR. 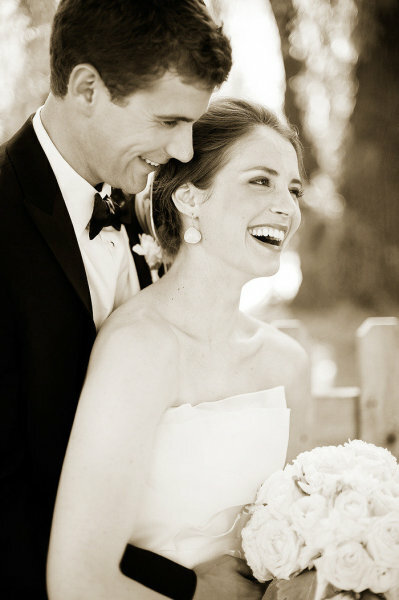 this is probably one of the loveliest weddings i've ever seen. so much my style, right down to the beatles cover band. just love those invitations!! what a stunning wedding. 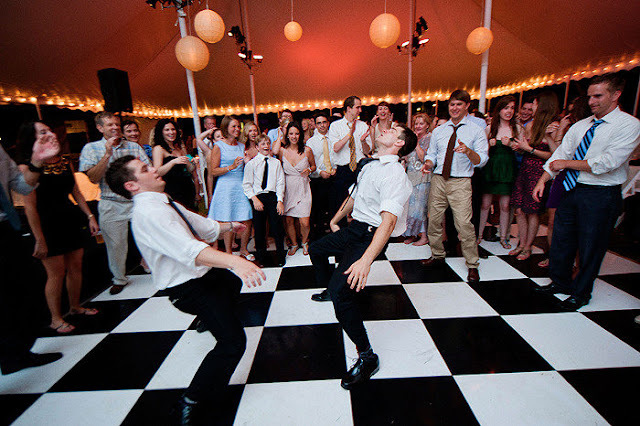 and the dance floor tiles provide such an amazing graphic backdrop for the reception photos. LOVE IT. what a beautiful, classy wedding. And I loved that they still included some fun details like ice-cream favors and a cookie display. love! Lovely wedding! The bride is very cute. The flowers are amazing. The look like made special for the bride and the wedding. They look perfect together.